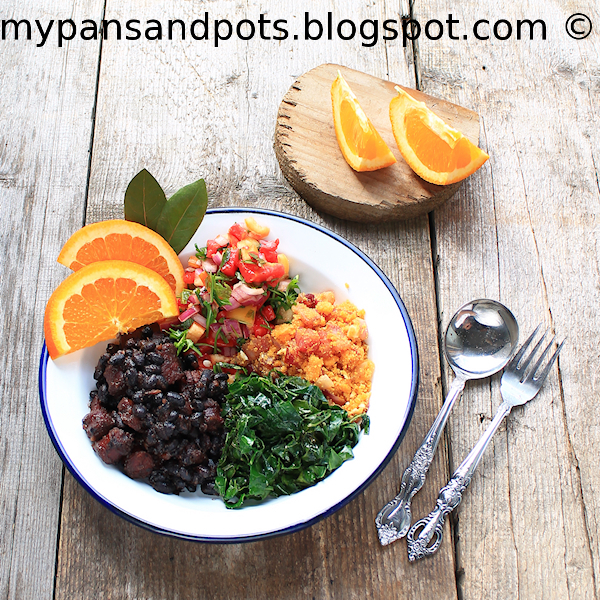 a traditional Brazilian meal Feijoada with farofa , vinagrete and collard greens. To be honest , I almost sat this one out. I've just came back from a two month trip and this challenge looked so involved . But after reading the impressions of the other members, I decided to participate. And I'm so glade. This meal was a real Brazilian feast. This hearty stew, delicious farofa and so many colorful vegetables were amazing. 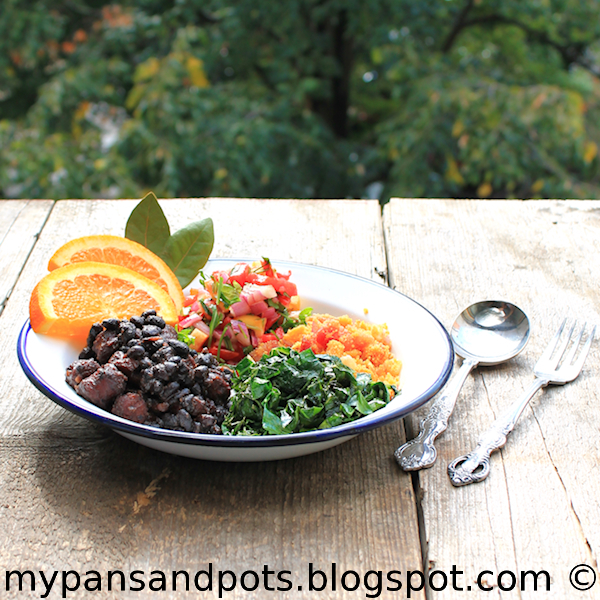 Feijoada is traditional Brazilian stew made black beans and mixed meat. This is enough for later use as well, if you want, you can halve the recipe. You want a paste, roughly chop the onions and garlic, then puree everything in a food processor or blender. Cover in water and rub, pour out water, refill and let soak. This can be done overnight, or first thing, before starting the beans. This will give a few hours of soaking and change the water at least 6 time. Wash thoroughly, put in a (5 litre) 5 quart (or bigger) pot, fill with water so that water is twice as high as the beans. Bring to a boil, let boil for a minute, turn off and cover. Let soak for an hour. After an hour, uncover. The beans will have soaked up the water and doubled in size. Add another 1-2 liters (4 -8 cups) of water so the beans are completely covered, bring to a boil, then lower heat and simmer, uncovered, for an hour or so, until the beans have softened, but are still firm. Chop all your bacon into small cubes. Slice your sausages around a ¼ - ½ inch (6 -12 mm) thick. Cut any pork or other meats into 1-inch (25 mm) cubes. Divide your ribs into pieces that will at least fit into your pot, the size is your choice. Put the bacon fat over high heat in a large frying pan. If you really don’t want to use bacon fat, which I recommend, you can use any vegetable oil that takes high heat. You want around a ¼ cup (60 ml) of grease, cover your pan well. Take out the piece of bacon fat after enough fat as liqudified and put aside for later, in case you need more. I needed it for the ribs. Next you have to fry all your meat in a very hot pan, until well browned and cooked through. Cook each type of meat separately, but in the same pan, and remember to drain well on paper towels, patting the tops as well to take off any excess fat. First fry the bacon until nice and brown and chewy, and set aside half to use later in the farofa. Then fry the sausages, the pork, the ribs, and any other meat. Really make sure each piece of meat is well sealed and cooked through, the bacon and sausage took about 5 minutes, the pork around 10, and the ribs around 15. Make sure that you have plenty of fat in the pan to fry the ribs so they cook through. At this point, if your beans aren’t ready, you can relax, or prepare the vinagrete, the recipe is below. When the beans have cooked to the point of being softened but still firm and your onion-garlic base and meats are ready, you can continue. Add to the beans 3 tablespoons of the onion-garlic base, 4 bay leaves, and your meat. Add enough water to make sure everything is just covered. Continue simmering until beans are done, which took me another 2 hours. After about 10 minutes, check the liquid to see if it’s salty enough for your liking. Depending on what meats you are using, the salt will have released into the liquid… if this hasn’t happened add a bit more salt, you want to taste the salt in your liquid, but it shouldn’t be too strong. This is a matter of taste as well. The water will start to boil down, for the first hour you should keep the water level to just the top of everything, but not completely covered. But you want your liquid to thicken, so start letting the water get lower and lower, with everything at least mostly immersed. You can also mash some beans at the bottom of the pot to thicken your liquid. If you haven’t already, prepare your vinagrete, it’s nice to let it soak up flavor in the fridge for a while. While the feijoada is simmering you can also chop your collards, prepare the ingredients for your farofa, and slice your oranges. To go with feijoada you need collard greens, it’s a perfect combination. You can chop these now, but cook them last, right before serving. Wash 4 collard leaves, cut out the stem, and cut in half. Stack all the halves on top of each other and tightly roll them up together.Keep a good hold to keep everything together and start slicing very thin through the tube to get nice fine slices of collards. When everything else is ready to serve, heat 1 tablespoon of olive oil in a pan over med-high heat. Add 1 tablespoon of onion-garlic base, and let soften for a minute. Add all the collards at once, and stir to coat with oil. You can add a pinch of salt and pepper. Cook, stirring, for only about a minute, you just want to them to start to soften, evenly, over quick high heat. And done. Farofa is one of the best things Brasil has to offer. Normally, it is made with farinha de manioca, yellow yucca flour, cooked in butter until slightly toasted. Less butter will leave it drier, and more butter will make a softer farofa. It is also made with farinha de milho, corn flour, or farinha de rosca, ground up dry breadcrumbs. You can use other things I imagine, they use panko where I work. You can find mandioca flour at many different Latin American markets. It can be called mandioca flour, mandioc flour, yucca flour, cassava flour, but they should all be the same, though a Brazilian brand would be your best bet. Make sure not to buy ready-made farofa, “farofa pronta”, this is already toasted, no fun. Since corn flour differs around the world, I asked my mom, who lives in Las Vegas, to test the recipe below with corn flour from the US. She bought Red Mills stone ground corn flour and followed my recipe. There is a photo below, it looks perfect and she says it reminded her of the one I made with yucca flour. I’ve made farofa with dry breadcrumbs as well, and it was delicious. Farofa is best served alongside foods with moisture, such as meats, beans, vinagrete, etc. You can add just about anything to farofa, as long as it doesn’t have moisture, such as any cooked vegetables, meats, and the best, chopped banana. I’ve added some suggestions below. Melt half of your butter, 2 tablespoons (30 gm/1 oz), over med-high heat. Add the onions and cook for a few minutes until they start to soften. Crack the two eggs into the pan and lightly break the yolk and spread around, but don’t break up too much. When the egg has cooked, almost fully, break up into med-large pieces. The onions will brown quite a bit under the egg, but I like this flavor. Add the cooked bacon, and stir. Add the rest of the butter, 2 tablespoons (30 gm/1 oz), and stir to melt. Lower the heat to medium, toss in the yucca flour and stir well, it will quickly soak up all the butter and start to stick to the eggs, onion, and bacon. Really feel free to have fun with your farofa, this is one of the reasons I was so keen to share it. Make farofa de banana to serve with a nice pork loin. Add green olives, corn, peas, asparagus pieces, sausage, ham, herbs, things like this that are leftover in your fridge, etc., etc. Add more butter for a softer farofa that can be eaten alone (that’s what my mom wants to do). Vinagrete, like farofa, has many variations and uses. This is a basic recipe, I used yellow bell pepper and chopped arugula, very refreshing and really gives a lift to the final plate. Farofa and vinagrete often go together and are my man’s favorite food. Chop the bell peppers, tomatoes and onions into small/medium pieces. Chop your parsley or arugula. Put all the ingredients into a bowl and stir well to combine. Press down on the veggies, the liquid should come almost to the top of the mixture, you want everything pretty much immersed. Cover and refrigerate for at least 30 minutes. Slice a couple of oranges for people to be able to grab when they need a refresher and serve immediately. 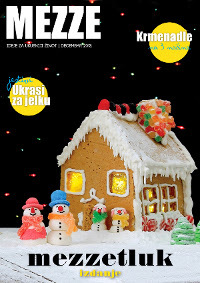 Sjajno izgledajuci tanjir...zdravo i ukusno! Osim što si se naradila (za što skidam kapu), jako mi se sviđa prva fotka. Genijalna je! Hvala Tamara. A da samo znas koliko sam negodovala dok sam ga spremala. Gundjala sam kako to da u pasulj ne ide sargarepa i paprika i otkud da jedem narandze uz pasulj. Ali sve se tako divno uklopilo, nemam reci. I would gobble that up and not even look back! Great recipe!